* Air Tickets (Lowest Price on International Tkts Guaranteed) *Hotels *Packages- Domestic & International *Conference *Incentive Tours *Volvo Buses. Chamba is an ancient town and a district in the Himalayan state of Himachal Pradesh. Chamba is situated at an altitude of 996 metres above sea level at the confluence of River Ravi and River Sal. The town is bordered by Jammu and Kashmir in the north-west and west, by Ladakh and Lahaul in the north-east and east and by Kangra and Gurdaspur on the south-east and south. From Chamba can be seen the snowy mountain ranges of Pir Panjal, Dauladhar and the Zanskar. Historically, Chamba was ruled by the Maru Dynasty. Chamba is named after a local princess, Champavati. Bhamour was the capital of the Maru rule at the time of Raju Maru, in 500 AD. But later it was shifted to the town of Chamba in 920 by Raja Sahil Varman on the request of his daughter Champavati. Chamba has a long history. It was ruled by almost 67 kings of the Maru dynasty. The first ruler of Chamba was the Kolian tribes. In the 2nd century, it was ruled by Khasas and Audumbaras. In the 4th century the Thakurs and Ranas ruled. It was also ruled by the Gurjara Pratiharas, the Rajput dynasty in the 7th century. Finally the British came and took over Chamba in 1846. Chamba has many historical sites. The Akhand Chandi Palace is the main attraction. The building is one of the best examples of the fusion of Mughal and British architecture. It was built between 1747 and 1765 by Raja Umed Singh who used it as his residence and is known for its distinct green roof. Champa is known for its ancient temples. There is a temple which was built by Raja Sahil Varman in memory of his daughter Champavati. 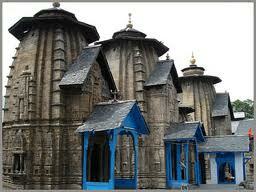 The temple exhibits the Shikhara style of architecture and it has a huge roof in the form of a wheel. The walls are covered by stone sculptures. Goddess Durga also called Mahishasuramardini is worshiped in this temple. The Lakshmi Narayan Temple complex, built in the 10th century by Raja Sahil Verman also draws a large number of tourists. The main temple consists of wooden chatries, a shikara, and a sanctum called Garbhagriha with an antarala and a mantapa. Copyright © 2012 ! The Voyage Travels website design by: VMS Pvt. Ltd.